Back to school! This time of year can be filled with a lot of joy coupled with a lot of anxiety for a number of reasons. One in particular that comes to mind: the dreaded school lunches! 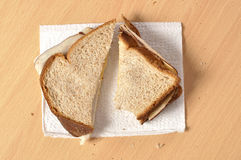 So what is a parent to do?Sandwiches have been a packable lunch staple for decades. They stand the test of time mainly because of the convenience factor, but sandwiches can get boring very easily and in reality, should not be consumed five days a week. Not only does our bodies need variety to ensure we are getting all of our proper nutrients, but breads, along with most pre-made packaged lunch items, are processed and full of unhealthy ingredients, such as sugar, unhealthy fats, high sodium, additives, food coloring, added flavours and overly processed grains depleted of nutrients. None of these ingredients are necessary or beneficial to your child’s health or give them the tools to thrive in the classroom. Let’s think beyond the sandwich and get more creative! I’m going to give you the best advice I give my clients when they come to me, looking to revive their lunches. Here we go! Number one, I’m sure you are used to seeing this one. Plan Ahead! It is easier said than done for sure but in my experience, when we can attach an emotion to the task, we are able to make it a priority even if it is a bit painful at first. And what emotional value do we have bigger than our kids and our health? Sometimes we can let social interactions and scheduled extra curriculars take priority over our evenings and weekends, when in reality the highest priority should be placed on what we fuel our body with. When planning ahead, try and plan what your children will eat for the week so you can be sure to have everything you need on hand. Some of these foods can be prepped ahead of time for the next 2-3 days. #2 – This one is so so important: talk to your children. Find out what healthy foods they enjoy and discuss with older children how they could be added to their lunch in a fun way and don’t forget to ask them for help. If you have a child who is picky, take some time to sit down with them and talk about the impact these foods have on their health or consider having a family visit with a nutritionist to talk about their eating habits. For children who are moderately high or extremely picky eaters, a nutritionist and therapist need to be sought out as this is a sign of emotional issues related to food that need to be addressed. #3 – How do we keep up with these school policies? As a nutritionist that sees clients from all over the city, I hear different struggles when dealing with teachers regarding lunches. Nut free is usually the rule of thumb now. Be sure you avoid anything that contains nuts or may contain traces of nuts. Some schools do not allow baked goods or things that look like peanut butter. Talk to your child’s teacher. Ask them what their policies are in the classroom, tell them how you plan to feed your children with whole, nutritious foods and are avoiding packaged, processed ‘food’ even if it is easier to read the labels. You can even write an ingredients list for the ‘unidentifiables’ and stick it right on the container. 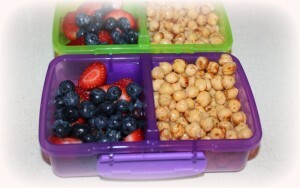 #4 – When packing lunches, keep in mind how many nutrition breaks your child gets. In the Sudbury area it’s three. Be sure to include appropriate foods that can be eaten within 20 minutes. Think quick, easy, and messless. I have included some examples further down in this article. #5 – When sending in hot or cold foods, we need to keep the proper food handling guidelines in mind. Be sure to keep hot foods hot and cold foods cold. Encourage your child to eat these particular meals first so they don’t have a chance to reach room temperature. To help your child remember the order to eat their snacks in, labeling food with 1-3 can keep them on track, eating the right foods at the appropriate nutrition break. #6 – Avoid packing treats as rewards or comfort. Kids can begin to develop negative embedded food related behaviours when they attach a certain emotion with treats. As most of us know, these behaviours as adults are very hard to break. Emotional eating anyone? Treats should be saved for special occasions, such as your child’s birthday, Holidays etc. After that, if you are still going to send a treat, keep this treat for the last nutritional break so it does not affect their ability to concentrate and behaviour all day. #7 – Make this a rule – Just pack water. That is all your child needs to drink during the day. By the age of 4, your child’s beverages should be 90% water. They can get all the calcium and healthy fats for brain development from healthy balanced wholefood. Healthy leftovers, like soup in a thermos. And of course, the sandwich. Sandwiches stick around because they are as awesome as you want to make them. Servings of bread are definitely acceptable in moderation (1 slice of bread is generally considered 1 of your 3-4 servings of processed food) so what about adding sandwiches to the lunch plan once a week but lessen the impact and search out sprouted breads or products made with sprouted grains. The grains used are not nearly as processed and the breads tend to have more macronutrients. Remember most breads require sugar and yeast yet another good reason to limit its consumption. I recommend Silver Hills brand which can found a different stores around Sudbury including Costco. Food for Life also has sprouted breads. As parents we need to remember the foods we pack in our children’s lunches can have a beneficial impact or a negative impact on their school day. Processed packaged foods, even the ones marketed as natural, healthy or sugar free, are predominantly unhealthy and can impact our children’s health, ability to focus and their behaviour which can also have a ripple effect on the other students in their class. By packing wholefoods we are giving their bodies all they need to stay healthy, alert and comfortable in their own skin. Not to mention a lifelong impact of good nutritional values they can take on into adulthood. Place in the oven for about 40 mins. (Ovens do vary, so keep a close watch as they may need less time) Stir around the chickpeas every so often to ensure proper browning. Remove from oven and let cool entirely before eating.